Bonnie's Blessings: A + A // I designed and illustrated a book cover! A + A // I designed and illustrated a book cover! It's been wayyyyy too long since I last did an Awkward and Awesome post. Not even sure why it's been so long. It just has been ages! Hopefully this post is awesome enough (sorry for a lame pun attempt, guys) to make up for that. Anyway, I'll allow you to make up your own minds about that! - Waking up with a pinched nerve in my neck. And having every head movement for quite a few hours plague me with sharp twinges of pain! - Coming across one of Those Words. You know those words that you just hate for no apparent reason? Well maybe you don't hate any words for no reason... maybe I'm just weird. Anyway I keep coming across the word 'bespoke' (you know, as in "custom-made" and "made to order") and cringing. I do not like that word. - Thinking in the middle of a conversation about something you want to say so you interrupt the person speaking. I have no excuses. I know that is dreadfully rude. I'm so sorry, world. I honestly do try not to interrupt people! It's something I've battled all my life. - Having those big misunderstandings where everyone gets confused. Dad had arranged to take the car in to town to get it serviced and he had booked that for Monday. Then on Friday he started talking about going into work early and getting the car serviced and we (that is, Danella and I) are like, "what???!! we had planned to use the car today!" And then much confusion ensued until someone checked the calendar and discovered it was indeed booked for Monday so everything was fine. - Catching up with friends again after coming home. Just so nice. - My new violin... her name is Marianna. She has a much nicer and more resonant sound than my previous violin. She really is beyond awesome and I just love playing her! Also is it just me that thinks violins seem feminine? I saw her and said to myself, "She looks like a Marianna." So that's what I named her. 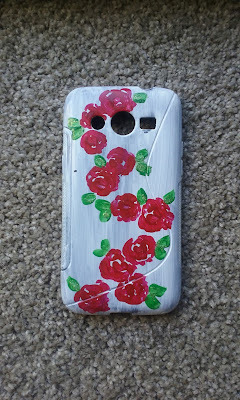 - The fact that I actually took the plunge and painted my cellphone case... like seriously it was a bit scary but awesome. It's actually black and I dislike black things but I've put up with it because it wasn't worth buying another case! Anyway the other day I was like, "you know what, I am going to paint it, then it won't be black." So I painted it, and now it's not black. I know you're just dying to see how it turned out so here you go. - Going on the Air New Zealand website and signing in to my Airpoints account on a whim, and finding that only half my flights on my America trip had gotten me airpoints so I grab my ticket and boarding passes (which I had fortunately kept because #memorabilia) and add the flights to my account and earn myself heaps of airpoints. Twas such an amazing feeling. Does your musical instrument have a name? How did you name it? 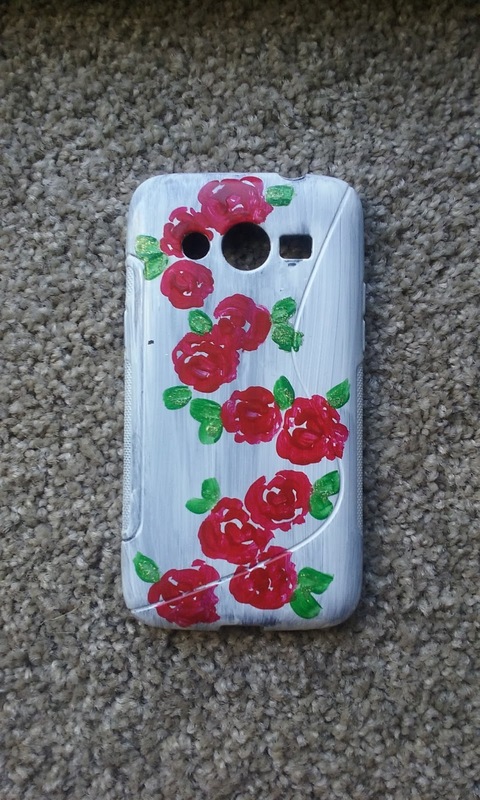 What does your cellphone cover look like? Finding another music buddy is awesome! Double high five! The book cover is just lovely! How long did it take for you to do it from start to finish? Oh great! I'm glad you enjoyed it. The book cover took me maybe an afternoon? I designed it, but I kept showing the progress to Mrs Campbell all along so I knew she was happy with how it was turning out. Then I painted it, waited for it to dry, scanned it in and edited it online so I could make the colours even brighter. Yes, I know about those words. I have a few of them myself. :) I can't say 'bespoke' is one of them, but then, I barely hear that word..
And that is awesome you got to design a book cover! And a new violin! How exciting! You'll have to share some photos of her. :) I think it's nice you name your instruments too. I like the idea, but names never seemed to come..
Oh, I'm trying to think of an awkward thing from this week.. maybe shopping for a car with my family, and getting in the way of the salesperson (who was overly nice, as they are), or trying to explain to my music teacher why I made myself a new watch band, and instead of her getting the correct message (because I wanted to, and then I can make it how I like it, etc), she picked up on the fact that it cost me nothing. And it's true that I'm super cheap, but there were other reasons too, okay?! Anyway, that's some of my awkwards from recently, haha. What are *those* words for you? I will share some photos of my new violin sometime... she looks quite similar to my old one, just a bit of a darker brown. Oh wow.... your awkward moments are amazing. Thank you so much for sharing! Ugh pinched nerves are the worst. That feeling where you want to wear something somewhere but you'll see the same people because it's the same day of the week? THE MOST RELATABLE EVER. IKR. Never actually had one before the described episode. It was not fun. Hehee you know the feeling? It's pretty annoying, right. I don't quite get what's so bad about wearing the same thing again. Nobody is going to think you wear it every day without ever washing it, or something! What I've Been Listening to // EXCITING NEWS! !